Figure 1: Flat and level, the tops of the Cypress Hills, Canada, were shaved flat by water, forming a planation surface. Later, local erosion cut into the surface, forming the wide valley in the foreground. The globe we call home is adorned with beautiful snow-capped mountain ranges and lush, wide valleys. Plains and plateaus are common. Have you ever wondered how these landscapes formed? Most scientists who study landforms (i.e. geomorphologists1) believe the landscape was carved slowly by the same erosion processes that they observe today. This idea, that the ‘present is the key to the past’, is called uniformitarianism. Starting with this belief, scientists try to imagine how rain, snow, ice and water eroded the rock bit by bit over millions of years. Increasingly, how­ever, these scientists are finding that there are many landscapes on the earth that they cannot explain this way. Planation surfaces are one such landform. 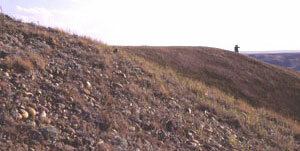 Figure 2: Water once surged across the continent, depositing these rounded rocks on top of the Swift Current Creek Plateau, Canada. Many cultures around the world speak about a global flood. Could the Genesis Flood solve the problem and explain these distinctive features of the earth’s surface? What is a planation surface? A planation surface is a large, level, or nearly level, land surface that has been ‘planed’ flat by running water (figure 1).2 Scientists believe that running water cut these surfaces because they are covered by rounded rocks (figure 2).3 Water is the only agent we know that can produce rounded rocks, by tumbling them against each other as it transports them along. It is important to understand that a planation surface was cut into hard rock by an erosive watery mechanism. 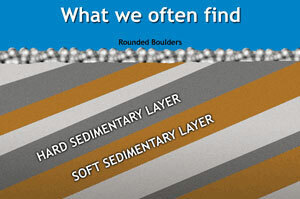 It is not a surface where sediments are deposited, like a river terrace, a gravel bar or a flood plain. Figure 3: A small stream is now cutting into a once-large planation surface. Planation surfaces can be amazingly flat. Once a planation surface has formed, creeks and heavy rain will often cut grooves and gullies into the surface, dissecting it into smaller areas (figure 3). Some planation surfaces are large, extending over 1,000 square kilometres. Yet, from the way they have been dissected, we can tell that they were even larger in the past. Planation surfaces sometimes cut across tilted sedimentary rocks. They are especially easy to recognize (figure 4). The layered sedimentary rocks are often a combination of hard and soft rocks. 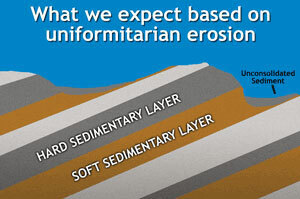 Surprisingly, the watery mech­an­ism that formed the planation surface eroded the layers evenly (figure 5). Today, normal erosion by rainfall and weather erodes the soft rocks into valleys, leaving the hard rocks as ridges (figure 6). Only a gigantic, fast-running water flow could have cut both the hard and soft rocks evenly. Figure 4: Near-vertical sediments have been cut to form the New England Tableland, Australia. Later, erosion carved the gorge, now home to the Wollomombi Falls. Every continent bears these marks of receding floodwaters. Geomorphologist Lester King4 has documented that planation surfaces are abundant on all continents and found at different elevations. He noted about 60% of Africa is a series of planation surfaces. Some planation surfaces are located on the top of mountains (figure 7), including some that rise out of the Antarctic Ice Sheet. Australian geomorphologist Rowl Twidale5 accepts King’s general scheme that remnants of planation surfaces punctuate the scenery of all the continents, usually at three elevations. Figure 5: On a planation surface, both the hard and soft layers of rock have been shaved flat and covered with a layer of water rounded boulders. Figure 6: Normal erosion produces an uneven landscape, removing the soft strata and leaving the hard. Yet, at today’s rate of erosion, the continents would be reduced to near sea level in 10 to 50 million years.8 Obviously, these flat landscapes cannot be that old. They are clear evidence that something is wrong with the dating methods. All agree that planation surfaces were formed in the past by water. The water would need to have been moving at high speed to erode soft and hard rocks evenly and leave boulders on the surface. The size of some planation surfaces indicates the flowing water covered a wide area. Furthermore, planing was the last major event to shape the landscape. Figure 7: Planed granite peaks of the Beartooth Mountains, south-central Montana, USA. These observations fit well with the retreat of water off the land during Noah’s global Flood.11 High-speed water currents over wide areas would have carried rocks of many sizes. Moving rocks would have planed the surface flat, like sandpaper smoothes rough wood. As the sea level lowered, the retreating floodwater would have cut the landscapes at lower and lower levels, producing planation surfaces at different elevations. Since planation surfaces are found all over the world, they provide strong evidence for a global Flood as described in Genesis. In fact, only the Genesis Flood can explain planation surfaces. The study of landforms is called geomorphology (geo = earth; morph = form, structure or shape). Return to text. Bates, R.L. and J.A. Jackson, J.A. (Eds. ), Dictionary of Geological Terms, 3rd edition, Anchor Press/Doubleday, Garden City, New York, pp. 170, 387, 1984. Return to text. Crickmay, C.H., Discovering a meaning in scenery, Geological magazine 109(2):173, 1972. Return to text. King, L.C., The Morphology of the Earth—A Study and Synthesis of World Scenery, Hafner Publishing Company, New York, 1967. Return to text. Twidale, C.R., Antiquity of landforms: an ‘extremely unlikely’ concept vindicated. Australian Journal of Earth Sciences 45:657–668, 1998. Return to text. Crickmay, C.H., The Work of the River: A Critical Study of the Central Aspects of Geomorphology, American Elsevier Publishing Co. Inc., New York, p. 127, 1974. Return to text. Nott, J. and Roberts, R.G., Time and process rates over the past 100 m.y. : A case for dramatically increased landscape denudation rates during the late Quaternary in northern Australia, Geology 24:883–887, 1996. Return to text. Roth, A.A., Origins—Linking Science and Scripture, Review and Herald Publishing, Hagerstown, Maryland, pp. 263–266, 1998. Also Walker, T., Eroding ages, Creation 22(2):18–21, 2000. Return to text. Ref. 6, p. 192. Return to text. Thomas, M.F. and Summerfield, M.A., Long-term landform development: key themes and research problems; in: Gardiner, V. (Ed. ), International Geomorphology, Part II, John Wiley & Sons Ltd., pp. 936–956, 1986. Return to text. Walker, T., A biblical geological model; in: Walsh, R.E. (Ed. 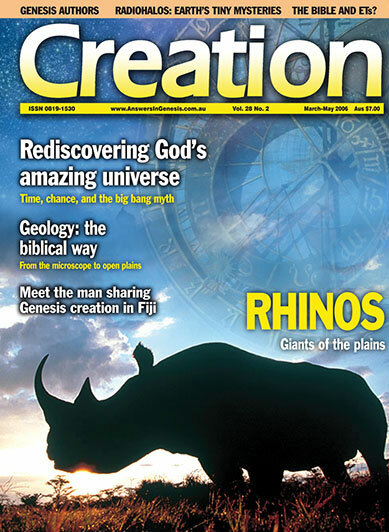 ), Proceedings of the Third International Conference on Creationism, Creation Science Fellowship, Pittsburgh, Pennsylvania, pp. 581–592, 1994. Return to text. Oard, M.J., Antiquity of landforms: objective evidence that dating methods are wrong, Journal of Creation 14(1):35–39, 2000.